Homepage . Artwork . Design Services . Sailing . Sitemap .. The bar seen in these photographs was made by four college students with $200 and about two weeks. It's easy to build, cheap and looks fantastic. After looking at other do it yourself homemade bar plans on the internet, we decided that none would ever be quite as awesome as a bar we designed ourselves. We made an extremely manly expedition to the local home depot to check out our different options. As the resident sculptor, I was chosen to draw up some plans. The bar top is 8' long and 24" wide. It stands 44" off the ground and the whole structure is 36" wide. The room where it resides is about 12'x24', providing ample space to move around. The bar top and counter top are both made by cutting one sheet of 4x8 plywood down the middle. We used a finely sanded hardwood maple sheet resulting in a sturdy bar top which "feels good and solid." 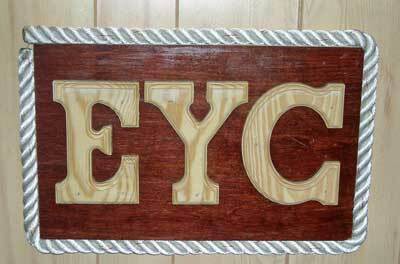 The edging is simply some crown molding secured flat on the top. There is also a thin strip of wood which covers the ugly plywood edges. The back edge has a 1.5"x 3/4" strip which gives it a nice effect from the back. The rear counter is supported by the leftover studs from the frame and some cheap drywall screws. We found a stainless steel pan and turned it into a dry sink. Halfway through construction we realized that there wasn't enough clearance on the countertop for bottles, so we added the drop down section of the counter. The top of the bar is covered with two coats of stain and several coats of urethane. The front paneling is made of cheap 1/8" fiberboard and should be upgraded if your budget allows. We used various pieces of molding to cover the corners and floor molding. To make your bar as awesome as possible, you need the proper accessories. We added a series of bronze cleats to the top, a ships bell, and a bottle opener. We had planned to attach a pair of skis to the front, but they were too bomber to accommodate any sort of attachment system. If I were to construct this bar again, I would lower the back countertop several inches to allow for better preparation space. If your desired bar room is smaller than ours (12x24) than I would suggest making your bar 6' long instead of 8'. The construction team is hard at work installing the bar's dry sink. The finished product (back) - you can see the counter, sink and part of the dropped counter section. The front of the bar before installing our insignia. The drop-down section of the bar was designed to accommodate tall bottles and blenders. Note the bottle opener. The primary structural framework of the bar. Yup, it's bomber. 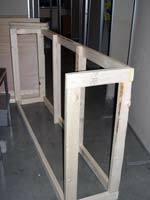 An example of one of the glued joints used to build the frame of our home made bar. 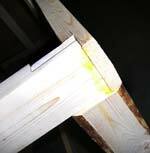 Another example of a 3 way corner lap joint.